Join Student Activities as we host a pep-rally in preparation to play Stephen F. Austin at the annual Battle of the Piney Woods! 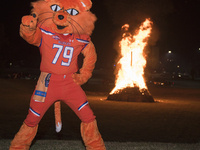 Hear from various athletics teams, band, spirit programs, and SHSU President Dr. Dana Hoyt! We will end the program with a fireworks display and a bonfire.